In London, in a crowded tube train in the early 1980s I saw Jesus. 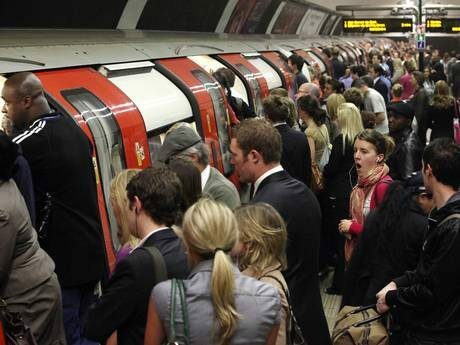 It was the after-work rush hour and everyone was squashed tightly like sardines into the carriages. There was hardly breathing room. I was standing, with many people pressing against me and their faces were bright under the ceiling lights. Many didn’t look so healthy and a bit pasty faced against the artificial light. I am a people watcher and I looked around at all the faces to philosophize about their place in the eternal scheme of things. I casually turned my head, hoping to glimpse all that were in view as discreetly, as possible trying not to stare. Normally I can see and feel people’s auras. Sometimes I look at them when there is time to spare and wonder how they got all the colours and patterns. I was casually glancing my eyes on the faces around and directly opposite me was a man dressed in a navyblue suit. I am about 5 feet 6 inches so I would say he was about 6 feet tall. Under the artificial lights and noise of the train he looked an oasis of peace and order. I looked again at his face to get another look and saw that he wasn’t going to look back at me and was almost giving me the go ahead to give him a really good stare, without either pretending I wasn’t there, or responding emotionally that he was being watched and was aware of it. There was absolutely no response at all from him, or that he was going to mind if I couldn’t resist looking a bit longer than was good taste at someone opposite me, so close. He had a very handsome face. Anyway, I noticed that he didn’t have a pasty face, all white and sick looking like the rest of the passengers. His skin looked glowing with good health and I wondered why. How could anybody in this rat race ever look healthy I wondered, with no obvious sign of being in the sun? His skin was exactly the same as an English person, white. I puzzled on why he didn’t have black circles under his eyes as his face looked absolutely perfect. A computer couldn’t have generated a more perfect shaped face. He had an oval shaped face, with a straight nose of medium length and medium brown hair cut short and neatly. His eyes were medium blue and the lids were unhooded and he looked about 30. The dark eyebrows were arched up and very subtlely matched with the eyes so that they didn’t stand out. The cheekbones were curved so as to add a nice form to the face and they made his face look intelligent and fine featured especially with the forehead clear and well shaped. The jaw was equally curved so it didn’t look angular or weak. It just completed a perfectly balanced design that made this man look just a bit too perfect, for my artist’s eyes to believe he was really a London business man, who never lay in the sun to look so glowing with vitality. I looked up at his face yet again and still he didn’t mind me taking another long peek. I knew he was reading everything about me, though I could not read a single thing about him. It was too puzzling for me, where was his aura? He didn’t have one. He didn’t project any emotions at all. I am telepathic and it can be easy for me to pick up thoughts of people nearby but this man didn’t project any thoughts either. I looked up at his face again and saw that he didn’t have a fleshy energy – he was like a hologram as far as radiating earthiness and the activity outside himself of the processes inside, e.g. emotions, thoughts, desires etc. Yet I felt the presence inside him really deeply. How could anybody have no aura, or any evidence at all that there was a person like ourselves inside this image yet I can feel a distinct peacefulness and not only that, but having let this peacefulness flow into myself the quiet was so deep that I started to understand on a deeper level what was happening with this man. I looked up at his face again and he as usual didn’t look back, yet I knew he was a billion times more subtle than me, though he didn’t respond to me at all in any way at all. Nothing. Not even a smile of amusement at my examining every inch of his face. He had a smart suit on and his shoulders were broad. He stood straight and elegantly amongst the squashed and worn out people after a hard day at work. Not an ounce of tiredness was present in his face. After about 15 minutes of standing right close to him, his peaceful energy seeping slowly into me and becoming very quiet in my soul, I felt that he belonged to the universe and was a ruler of it. For some reason his intelligence started to slowly enter my consciousness and I felt that he was an ambassador from God. He made me feel so quiet, I perceived consciously an awareness of his ability to run the universe. For some reason it seemed to reduce in scope from being an enormously overwhelming complicated mass of stars to one where all was well, where every problem could be dealt with swiftly and extremely efficiently. His experience of running the universe was overflowing into my mind. He appeared to me as a hologram due to the fineness of his energy. For some reason the whole world to me, slowly began to match him – in his presence it was very distinctly maya/illusion. It was like the atoms had somehow become unraveled and the gaps inbetween had been huge and what was between all these atoms showed through. Each atom had stopped spinning so fast and had slowed down and become transparent. I felt small enough to see one atom and the distance to another atom, as a big empty gap. This man made the atoms slow down for me for a moment so I could see through them and right out across the universe. The whole universe was his home – I knew it. Yet I felt so huge as well that the universe was able to be walked through, whole galaxies were around me as small as apples. After I realized that this man opposite me was not only, not of this earth, nor was he just another alien (I had spoken with lots so I knew the difference), nor was he an angel (I had spoken with angels previously too) but he actually RAN the universe and was an ambassador of God. I looked again at his face and I knew he was responding to me and he knew that I picked up, that he was not of this physical world, but was much more than that. He was a ruler, with enormous power and majesty. My mind started to draw on all the things I had read and experienced of the evolutionary process and I wondered how much more advanced he was than us mere mortals, still stuck in the cycle of rebirth. I worked out by a process of analyzing that he could have been at least 5 million years ahead of us still here on this planet. Weighing up his abilities I figured it would take that long to develop that peace which he emanated and to dispose of any material world troubles that would accumulate by having to live elsewhere in the universe as well. I figured the earth was far too limiting in scope for him and he would have to have at least millions of years experience to refine himself to that extent. It was just a random guess but I wanted to try to understand him, somehow even if it was by this method. I was engrossed in philosophizing about him and what he would have to do to become so powerful and how difficult it would be to walk completely undetected and what he would be doing here on the planet. While I had this question in my mind I looked at him again. A vision of the UN flashed in my mind out of nowhere. He worked for the UN as a consultant. It wasn’t business or agriculture. I felt that the information was given to me as a gift from this person so I wouldn’t have to spend ages going through all possibilities. Thank you. A person who advised on the help for 3rd world countries and took care of the suffering, by getting sponsors and making sure aid got there. I was so impressed that this person was so kind. At least it got done, perhaps it hurries things by materialising to ask people directly. Suddenly he tapped me on the shoulder and took me away from my deep thoughts on him. “Excuse me there is a seat over there” and he pointed to a vacant seat. I was shocked, nobody had ever offered me a seat before. It was usually every person out for themselves. I smiled at him and for the first time he looked at my eyes and I thought I had known him before. It was like time stood still for me and this confirmed everything for me that he was definitely not of this world, though he had pleasant eyes that seemed to express ability to communicate on our level easily and inconspicuously. When he talked a huge amount of energy escaped from his voice and it was like a cleansing spiritual wind had blown away the clutter in my mind of trying to find out more. His eyes were soft and expressed love and emotion. I sat down and thought, I wonder if he is being English for now as he sounded English when he talked – in a soft cultured voice. Very soon the person on my left got up and went and he came and sat next to me. I knew he was a hologram or at least felt like one to me. I thought I could put my arm through him. I laughed to myself at catching him out. I had read books on the ascended masters walking around among us but I thought to myself, this is not an ascended master he is too powerful for that and he rules the universe under orders from God. He is God’s ambassador confirmed I thought, at least for this universe, though not sure about other universes. I was so pleased that I ‘managed to spot one of the Beings among us’, but I said to myself there just can’t be two of these people so he must be the most powerful of them all. How could this man run the universe and have anyone above him but God? His power was mighty. I curiously moved my mental body in his direction to try to pick up his thoughts. It bounced back immediately, repulsed by an impenetrable barrier which was as hard as his body appeared insubstantial to me. I was taken aback. His mind was so wrapped up in some barrier, that it seemed absolutely impossible to even get near. It was like a magnetic force field, which made all his thoughts completely unable to be read at all. No wonder I never picked up any reponses from looking at him. Everything which was inside of him was tightly bound up so not a single thought or emotion escaped or got penetrated by the deliberate thoughts of others to perceive them. As I sat next to him I could feel the force of the barrier around his head and it seemed as if that was the real him and not the body. I also knew that he was binding up an electrifying intense blinding light which would escape and give him away if he didn’t hide it. He hid it beautifully and made no impact, on even someone a bit sensitive, right opposite. I guess if we think of someone and deliberately try to enter their consciousness, some part of ourselves actually goes to the mind of the person and gets in if they let it. He did not let me even on the edge of his consciousness and the little I did get, was enough to let me know running the universe was easy for him. He then said to me by telepathy and really loudly – WE ARE AMONG YOU. Then shortly after he got up and left the train. This is the absolute truth. I never knew it was Jesus, as I was not a Christian then, had never read the Bible or even gave Him any thought. Although I will admit He did appear to me in a Catholic Church when I was about 14. I was anti-religion then, and I never really knew why He appeared to me as I’d believed we came from apes. He told me personally over ten years after seeing Him on the train, that it was Himself, after a few more experiences of Him appearing to me. But I never ever considered that, the man on the train was Him. However I never stopped wondering who it was, somehow I didn’t think Jesus would appear so undetectable, like that. I became a Christian in 1984. I can still see every detail of His face in my memory. One day I hope to draw a picture of His face.